Villa Barbaro, located in the village of Maser adjacent to the famous hilltown of Asolo, was built for Daniele Barbaro, Patriarch of Aquileia, and his brother Marc'antonio Barbaro, an ambassador of the Venetian Republic. Construction began in (prob.) 1549 and was substantially completed by 1558. The Tempietto (chapel) was constructed 1579-80. The central residential space is erected on the remains of a medieval castle or manor house. Its facade features four engaged Ionic columns adapted from the Temple of Fortuna Virilis in Rome. As at nearby Villa Emo, barchesse (farm buildings) extend symmetrically from the left and right of the central structure. The ends of the barchesse are surmounted by dovecotes, each with a large sundial on the facade. The result is the famous 5-part profile familiar in later Palladio-inspired architecture, including the U. S. Capitol building (with the Houses of Congress replacing the dovecotes!). The interior of the central residence is highlighted by magnificent frescos executed between 1560 and 1562 principally by Paolo Veronese. Set in the hillside at the rear of the central residence is a spectacular spring-fed statuary grotto known as a nymphaeum. The nymphaeum may have been the conception of the villa's patrons. One of them, Marc'Antonio Barbaro, executed several of its statues and contributed other sculptural decoration to the villa as well. 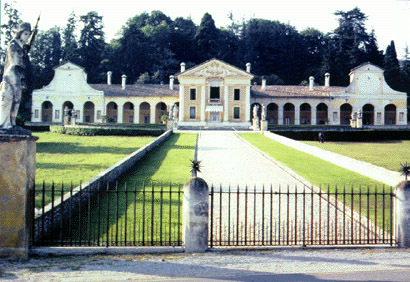 The villa first descended through female lines in the same family until 1838. In 1934 the villa was acquired by Giuseppe Volpi di Misurata, who began the restoration that has returned to villa to its present condition. Today his granddaughter resides at the villa with her family. Location: Maser (Treviso District). Accessible by car from Asolo (10km) or Venice (60km).